Oops - we don't appear to have a video for the DocuMate 4830i. The Xerox DocuMate 4830 is an effective way to index stacks of large-sized documents and import them to a content management solution in a single step. The DocuMate 4830 is an affordable, entry-level A3 scanner that offers outstanding performance and exceptional reliability for corporate workgroups/departments and small or medium-sized businesses. The DocuMate 4830 has a friendly interface that allows the user to simply insert their document and press one of the buttons on the front panel of the scanner to initiate scanning and automatically email, print, convert or share the file. The buttons are preset at the optimal resolution, colour depth, file format and paper size for common scanning tasks, but of course can be easily changed at any time. 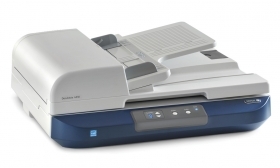 Ultrasonic Double Feed Detectionis built into the DocuMate 4830 so youll never miss a page due to a misfeed or a stapled document going through the scanner. Ideal for document management, the DocuMate 4830 includes software tools to edit, crop and retouch scanned images and organise the files into folders. With the touch of a button, users are able to scan and automatically upload their documents to popular cloud destinations such as Google Docs, Evernote, Dropbox.net and others. Documents are the substance of communication, reference, negotiation and execution of contracts, law and evidence. Fast reliable and cost effective document imaging solutions like the DocuMate 4830 provide almost immediate return on investment when implemented as part of a secure document capture solution. Regulatory compliance requirements have dramatically increased the need for companies to implement secure and reliable records management. And document capture solutions have become essential to meet the everyday document imaging needs of paper intensive offices. Businesses in the healthcare, transportation, and industrial manufacturing markets, as well as law firms, courts, clients and administrators who handle and manage substantial quantities of paper will immediately appreciate the DocuMate 4830s functionality, speed and low cost. Fast, reliable and cost-effective, the DocuMate 4830 will provide an almost immediate return on investment. It might even happen before you realise that your entire office is organised. OneTouch is an easy-to-use utility that connects the DocuMate 4830 scanner with a powerful set of scanner settings to greatly improve the efficiency of your workflow – so that with one touch the document is scanned automatically to email, office and ECM applications, printer, a file folder, or to one of many cloud destinations. DriverPLUS is a new generation of driver technology that is based on TWAIN 2.1 specifications that provides advanced features and greater reliability for both users and system integrators. DriverPLUS combines the features of advanced 32- and 64- bit native Windows-based TWAIN and WIA drivers PLUS new Acuity optimisation software and a sophisticated user interface. PDF Converter Professional features 100% industry-standard PDF creation and editing plus the worlds most accurate PDF conversion to editable Microsoft Office formats available. PDF Converter Pro enables users to create, convert, edit, assemble and securely share PDF files like never before.